The Range Rover is now available with a plug-in hybrid drivetrain as well an updated cabin and new tech under a mid-life facelift. The new Range Rover PHEV. Available to order now, the 2018 model gains the P400e petrol-electric drivetrain – also now offered in the Range Rover Sport line-up – in both standard and long wheelbase models. This combines a 296bhp 2.0-litre four-cylinder Ingenium petrol engine with a 114bhp electric motor and married up with permanent four-wheel drive, replacing the diesel-hybrid version on the outgoing model. As with the Range Sport, this enables a fully electric range of up to 31 miles when fully charged, or a combined power output of 398bhp with petrol and electric power working together, reaching 62mph in 6.4 seconds – 0.1 seconds slower than the Range Rover Sport – with a top speed of 137mph. Measured on the NEDC cycle, the Range Rover P400e emits 64g/km with a claimed combined 101mpg. The 13.1kWh high-voltage lithium-ion battery – which is mounted at the rear beneath the boot floor – comes with an eight-year, 100,000-mile, 70% state of health warranty and can be charged in 2 hours 45 minutes at home using a dedicated 32 amp wall box or in 7 hours 30 minutes using the 10 amp home charging cable supplied as standard. 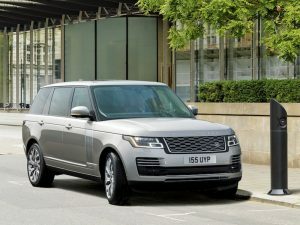 The Range Rover P400e joins the existing 254bhp 3.0-litre and 334bhp 4.4-litre diesels and the 335bhp 3.0-litre V6 and 518bhp/558bhp 5.0-litre V8 petrols, with the latter seeing a 15bhp increase. Other changes to the 2018 model include a completely redesigned cabin and seating layout in the rear and the addition of the Touch Pro Duo infotainment with two high-definition 10-inch touchscreens and a 12-inch Interactive Driver Display. Prices for the facelifted Range Rover start from £79,595 for the standard wheelbase 3.0-litre diesel in Vogue trim – up £2,800 on the outgoing model – with the P400e coming in £7,370 higher at £86,965. The long wheelbase P400e model starts from £113,065.For more of the latest industry news, click here.